Testing analysis services are precarious element in many industries and has the potential to save time and money by performing critical analysis throughout the product life cycle and improve customer satisfaction by delivering defect-free product. Testing laboratories are significantly increasing these capabilities to better serve prospective businesses as they continue to pursue ways to decrease cost, enhance analytical testing, and increase the flexibility of their testing analysis programs. The key objectives of testing and analysis companies include ensuring that their products reach the best possible quality and safety levels in all markets in which they operate. The companies also intend to continue development and acquire the most inclusive range of advanced testing technologies as well as expand geographical reach in order to support clients’ increasingly stringent quality and safety standards and expanding demand of regulatory authorities across the world. The testing and analysis services market has been segmented on the basis of sample type, analysis type, industry and geography. Food and beverages samples accounted for the largest share of the global testing and analysis market by sample type in 2014 due to presence of large number of small and medium food companies which outsource most of the testing services. Moreover, the food and beverage segment is likely to expand at the highest growth rate from 2015 to 2023 due to increasing awareness among people about food safety and rising demand for quality food among people globally. Based on analysis type, the market has been classified into elemental, organic, isotopic, particle size, mineralogical, metallurgical, petroleum and petrochemical, biomedical and biopharmaceutical, and others analysis. In 2014, elemental analysis segment is projected to account for the largest share of the testing and analysis services market. Around 44% of businesses (SMEs) outsource elemental analysis services to analytical testing companies. Furthermore, approximately 70% of outsourced elemental analysis services are provided by the industry and 30% of services are delivered by institutions (public and private). Based on industry, the market is segmented as food/beverages, pharmaceuticals/medical device, energy, minerals, chemicals and other commodities, environment and metal and alloy. In 2014, the food and beverages industry segment is estimated to account for the largest share of the global testing and analysis services market. Furthermore, the food and beverage industry is one of the major contributors to growth of the testing and analysis services market and has historically witnessed consistent growth. On the basis of geography, the market has been segmented into: North America, Europe, Asia Pacific, Latin America, Middle East and North Africa (MENA), Rest of the World (RoW). North America was the largest regional market for testing and analysis services market in 2014, followed by Europe. The dominance of these two regions is attributed to growing demand for technologically advanced elemental analysis services and financial capability of SMEs (manufacturing sector) to avail and afford expensive services. Furthermore, increasing demand and high preference for environmental and chemical testing services is likely to fuel the market growth in this region from 2015 to 2023. Asia Pacific is anticipated to witness the fastest growth rate during the forecast period due to manufacturing migration to Asian countries and increased penetration European and American testing companies in the region. Major players operating in the testing and analysis service market include Bureau Veritas , SGS S.A., Intertek Group plc, ALS Global, Eurofins, Exova, TÜV Rheinland, Acuren, Maxxam, Koninklijke Philips N.V., TÜV SÜD, Applus, and LECO Corporation. This report on the testing and analysis services market studies the current as well as future prospects of the market. The stakeholders of this report include testing and analysis companies catering to Pharmaceutical, biomedical, petroleum, energy, food and beverages, mining, metal, and other heavy industry. In addition, the report also include extensive coverage of instruments for testing services which may help equipment firms to understand this market form consumer prospective. This report comprises an elaborate executive summary with a market snapshot providing overall information of various segments and sub-segments considered in the study scope. The section also provides with overall information and data analysis of the testing and analysis services market globally with respect to the leading market segments based on sample type, analysis type, industry, and geography. On the basis of sample types, the market has been further categorized into water, soil/sediment, clay mineral, metal alloy, biological sample, food, chemicals, corrosion, oil and gas, and minerals and ores. By analysis type the market has been classified into elemental, organic, isotopic, particle size, mineralogical, metallurgical, petroleum and petrochemical, biomedical and biopharmaceutical, and others. The industry covered in the report includes food/beverages, pharma/medical device, energy, minerals, chemicals and other commodities, environment and metal and alloy. The market revenue in terms of USD million for the period between 2013 and 2023 along with the compound annual growth rate (CAGR %) from 2015 to 2023 are provided for all segments under sample type, analysis type, and industry considering 2014 as the base year. On the basis of geography, the market has segmented into: North America, Europe, Asia Pacific, Latin America, Middle East and North Africa (MENA), Rest of the World (RoW). Market revenue in terms of USD million for the period between 2013 and 2023 along with the compound annual growth rate (CAGR %) from 2015 to 2023 are provided for all region classified under the geography, considering 2014 as the base year. Each of the segments has been analyzed in detail for market trends, recent developments, outlook, and opportunities. 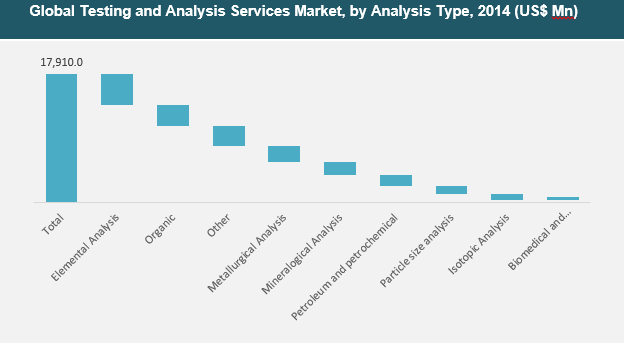 The market overview section of the report explores market dynamics such as drivers, restraints, and opportunities that currently have strong impact on the global elemental analysis services market and could influence the market in the future as well. Market attractiveness analysis has been provided in the market overview section in order to explain the intensity of competition between leading market players. Porter’s five forces analysis is also explained in this section to understand the market considering different parameters that have an impact on the sustainability of the companies operating in the market. The competitive scenario among different market players is evaluated through market share analysis in the competitive landscape section of the report. All these factors would help market players to take strategic decisions in order to strengthen their positions and expand their respective market shares globally. The report also profiles major players in the testing and analysis services market based on various attributes such as company overview, financial overview, business strategies, product portfolio, and recent developments. Major players operating in the testing and analysis service market include Bureau Veritas , SGS S.A., Intertek Group plc, ALS Global, Eurofins, Exova, TÜV Rheinland, Acuren, Maxxam, Koninklijke Philips N.V., TÜV SÜD, Applus, and LECO Corporation. Many of these players continuously innovate by developing new testing methodologies with technological advances in order to maintain their positions in the global market.